When it comes to multimeters, they have to be durable and contain a plethora of information. That’s exactly what we were looking for as we embarked on a quest to find the best ones in the market. We quickly decided that ease of handing, reading ranges, and extra convenience features would be our top priority in our search. In the end, the Fluke 115 Compact True-RMS won our gold place. The Triplett 9055 6-in-1 tool won second silver place. The Greenlee DM-510A True RMS pro won our bronze pick and the Etekcity MSR-R500 walked away with the budget buy title. 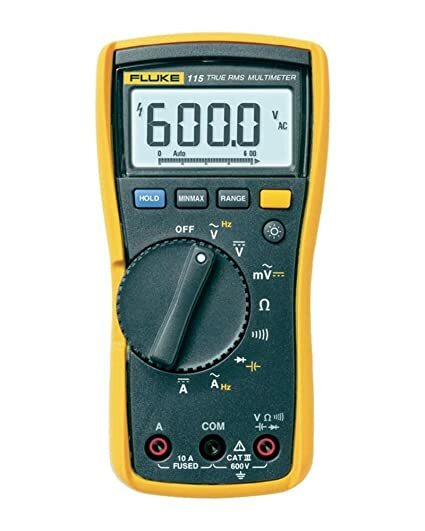 Our number one gold selection is the Fluke 115 Compact True-RMS digital meter. We loved how easy this one was to handle, and its added features like the standing bale and clear backlight. On top of doing its job as a multimeter, we felt that manufacturers went the distance to create a tool that offers the best performance possible. One of the most helpful elements of the Fluke is its body. This is definitely what made it a unique and helpful product, and a huge part of what made it our number one selection. It is wrapped in a solid yellow rubber casing for durability and ease of holding. Imagine working in a tight spot out in the harsh elements. This multimeter is not going to have a problem standing up to the wind, water, or cold. The case is thick but pliable. It felt good in our hands and sturdy. We loved the size of this meter because you can easily hold it in one hand, use the selector switch with the same hand, while using probes with the other hand. This one-hand operation is convenient and efficient. It has a hold button to freeze the display, a min/max, an average and a range switch. The three inputs are for common, resistance/capacity/diode, rated for 10A (but can reach 20A). Its maximum voltage is 600 with surge protection of up to 6kV peak per IEC62020-2 600 CATIII – pollution degree 2. The display updates conveniently every 4 seconds with digital 6,000 counts. Its bar graph has 33 segments to it and can update at 32 per second. The DC millivolts range is 600mV/0.1mV with accuracy of 0.5% + 2. The continuity range/resolution is 600 Ω/1Ω. For diode testing the range/resolution is 2V/0.001V. Its capacitance is 1000nF/1nF, 10.00µF/0.01µF, 100 µF/ 0.1 µF. 9999 µF/1 µF and 100 µF to 1000 µF. When it comes to functionality, we quickly realized this Fluke could go just about anywhere a field tech or electrician needed it. The meter offers a DC ma range from 200ma to 1A. You can also check frequency, capacitance, continuity and diode. You can get accurate readings on non-linear loads and it measures 20 A—to seconds-momentary and 10 A-continuous. It can operate in temperatures from -10-degrees up to 60-degrees. That’s great news if you happen to be outside with it. It will still work and offer all the functions you need. All of its inputs are safe to CE, IEN61010-a CAT III 600volts. The Fluke multimeter weighs 550 grams and its 6.6-inches by 3.3-inches by 1.8-inches. By far it is the perfect size and weight to hold during tough assignments. It also comes with a 3-year warranty, something we greatly appreciated. By far this was one of the meters with the nicest hold to it. It also has a stable standing bale. You can easily set it up and use your hands to work with other features. The LED display is large and clear, and comes with a backlight. This is a handy feature to work with if you are in a dark area or in bad weather. The Fluke multimeter is our gold product because of its durability, build and overall power. We loved the extra convenience features built-in and its universal use for electricians and field techs. If you need one, this is a great option to check out. Our silver choice goes to the Triplett 9055 6-in-1 Autoranging digital tool. We liked this one because of its 6-in-1 feature. You can take it with you and get a multitude of read-outs on your jobsite, all with one handy tool. Here are our official thoughts on the Triplett. The Triplett is perfect for HVAC or electrical usages and it can perform a multitude of safety testing including Voltage and Amp readings. Let’s start with the case though. Like the Fluke, this one has an over-molded case for sturdy hold. It is red and made from durable silicone. It’s drop-resistant, water-resistant and dust-resistance. It also has double overload protection because of its design. This is another product that works well for any field technician on the go, or electrician. Weather or any external conditions for that matter, won’t affect this tool’s case or performance. We asked for products that were rigid and sturdy due to their use. With this multimeter, that’s exactly what we got. The nice thing about the Triplett is that it is a 6-in-1 tool. They include all-contact AC, humidity meter, dB for sound, LUX meter, contact-temperature with K-type probe, ambient temperature and traditional functions. With its regular multimeter functions it can give you AC/DC voltage, AC/DC current, etc. Its frequency range is from 5Hz to 10MHz. Its light meter ranges from 0 to 40,000 LUX. The sound level meter ranges from 35 up to 100dBC. Its voltage ranges from DC to 1000V and AC 700V. AC/DC current range is up to 10Amps. You can easily switch from F to C if needed. The backlight is bright. We especially liked the quality of the LED display with the Triplett. It is perfect for dark areas. Field technicians and electricians oftentimes get the dirty jobs—they have to go into dark basements and not-the-nicest conditions. Taking this meter with won’t be a problem. At just 1.1-pounds and with dimensions of 11.5-inches by 8.2-inches by 3.5-inches, it is the perfect carry-along meter that gives all the information needed during field testing. We also liked the grip on the tool. It was the perfect accompaniment to any dark dingy area of a building. You can easily take readings while maintaining a sturdy grip on it the entire time. An added safety feature we loved was a built-in non-contact sensor to alert you of dangerous AC voltages. One thing that we love when doing reviews is the manufacturer that goes to extra lengths for safety. If they can build in added features that have alerts for problems, we give them a few extra points. Plus, it has a 3-year warranty from date of purchase. If anything happens, the company will give you a brand new unit (not a refurbished one like a lot of manufacturers send). The fact that this one also comes with a low-battery indicator gave it even more points. This is perfect for the worker who needs to know that he or she is ready for a job at a moment’s notice and wants to be thoroughly prepared. 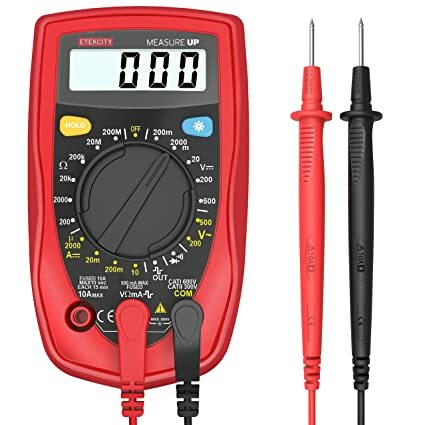 This is a fantastic choice in multimeter if you are looking for one. It offers a huge amount of information for a variety of applications. It truly is an all-in-one tool particularly well-built for HVAC technicians and HVAC readings. Regardless of who uses it though, it’s handy and helpful. We are proud to present it as our silver pick on the list. The bronze pick for us was the Greenlee DM-510A True RMS Professional Plant meter. We especially liked this meter because of its auto-features and its easy-to-read LED screen. Any worker would love to have this handy tool with them because of how helpful it is on the job. 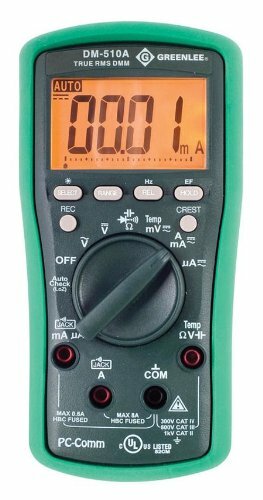 Here is what we thought of the Greenlee and why you should consider it as your next multimeter. The first thing that struck us about the Greenlee DM-510A was its easy-read display. It has a large numbered readout that can be seen in a wide variety of areas. We considered the deepest darkest areas of a business when brainstorming where our multimeter picks would be used. We wanted to be sure that they were clear at all times, and in all settings. The Greenlee definitely is a stand out because of it. Numbers are also backlit nicely to show clearly. The display takes up about 1/3 of the entire front case, which gives you a sign of how large it is. Anyone with issues on reading can use this high-visibility 6000-cound LCD with no problem. Next, we loved the Greenlee because of its many information readout advantages. It can read current, voltage, frequency and resistance. It also can handle diodes and continuity. There are dual voltage detection modes—one utilizes a single test lead and the other is non-speak. In terms of amperage, this tool can measure 600, 600µA; 60, 600mA; 6 8A. In terms of capacitance, it can handle 60, 600nF; 6, 60, 600, 3000µF. Frequency is measured at 10Hz-50Hz sine, 5Hz-999.9kHz logic level square. Resistance is measured to 6000Ω; 6, 60, 600kΩ; 6, 60 MΩ. Voltage is 60, 600mV, 6, 60, 600, 1000V. Overall this is a flexible tool that can offer some of the best and vast readings we found on the market. As our bronze pick it was a shoe-in. This is labeled as “professional grade” and we found that it definitely is. You won’t have any location where you can’t use this multimeter to get exactly the readings that you need. We loved how universal it was and how anyone can find an application for it on the job. We also enjoyed the feature of BeepJack. This allows for a warming when test sales opportunities are not inserted correctly in measurement terminals. It also has an auto power-off switch to it that helps with battery life. Speaking of batteries, it takes 2 AAA batteries. That is an indication of how compact and light it is. If you’re on the go with a lot of other tools and equipment, this is the perfect add-on. Not only does it offer you all of the information you need, but it’s easy to understand how to use it—right out of the box. One feature we also herald with the Greenlee is the analog bar graph. Not all multimeters come with this, and it was a notable addition. We picture this being used in a difficult-to-see area and any time we found additions that make readability easier, we listened. We also liked that the case of the Greenlee is tapered, with the top half being slightly wider than the bottom. This makes for an easy-to-hold and easy-to-grip tool. If you’re working in a difficult area, you won’t have problems with keeping this in your hand. All workers want their readouts quickly to get onto other jobs; this is the perfect tool for just that. It helps you gather what you need, so you can move on. One thing we really liked about our bronze pick was the auto-features. One was the BeepJack, but another is the AutoCHECK. This one enables the tool to automatically select the DC volts, AC volts or resistance with low impedance to allow for ghost-voltage riddance. Any additional feature that makes a worker’s job easier is loved by us. It immediately ingratiates the manufacturer to us and makes us want to take a second look at their product or service. We found that Greenlee did a great job of delivering a quality product with plenty of extra auto-features to benefit any user. The Greenlee weight 1.4-pounds and its dimensions are 9.8-inches by 6.7-inches by 3.7-inches. Again this plays perfectly to being able to carry it around with you, or store it in a pocket, for ease of use. It works with 1.5 volts, which we found was adequate to carry out most jobs with ease. This is a great product that benefits any worksite. It’s construction is just another sign that it is streamlined for ease-of-use and still offers a lot of readings needed to improve a job. Overall, the Greenlee is the perfect bronze pick for our list. 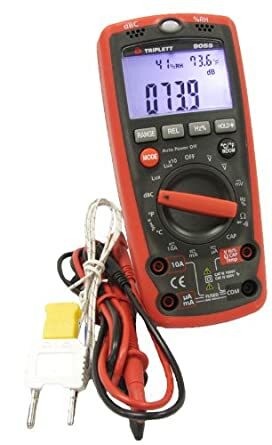 If you need a multimeter, this one has the perfect performance and abundance of auto-features you need. Test it out and you most likely will see exactly what we saw—a great little tool for just about any job. Rounding up our top picks as the budget product is the Etekcity MSR-R500 digital multimeter. When we pick our top products, we always save space for one product that doesn’t make it to our top three, but still has plenty of value to it and deserves a nod. With this list, it goes to the Etekcity brand. Not only is it convenient and straightforward, but hold and delivers a lot of information. Here is our official review of this product. The Etekcity is a solid choice in multimeter. Though it lacks a lot of the extended reading ranges, it still can get the job done for a wide variety of workers. It can accurately measure voltage, current, resistance, etc., just like our other picks. It is safety compliant with IEC61010 CAT.I 600V, CAT.II 300V, with double insulation. Its DC voltage range is 200mV/2000mV/20V/200V ±0.5%+2 and 500V 0.8%+2. AC voltage reads are 200V/500V ± 1.2% + 10. DC current rates at 2000µA/20mA ± 1% + 2, 200mA ± 1.2%+2, 10A ± 2% + 5. Its resistance is 200Ω ± 0.8% + 5, 2000Ω/20KΩ/200KΩ ± 0.8% + 2, 20MΩ± 1%+5, 200MΩ ± 5% (reading-10) + 10. It also has diode testing and continuity testing. The body of the Etekcity is sturdy and coated in a red plastic shell. Again- we loved this feature because of how easy it makes for a sturdy grip in cases of on-site jobs or difficult to reach spaces. This multimeter weighs 10.4-ounces and has dimensions 5.8-inches by 4.3-inches by 2-inches. It is a little smaller and more compact than our other selections, which isn’t necessarily a bad thing. It definitely had a different feel to it than our top three. While they were a little heftier, this one is much lighter. Is that good or bad? Can’t say—that’s up to the individual user, but if you’re used to a heftier feel, it might take some getting used to. Despite its difference in body, the Etekcity still is a great option for multimeter. It has a small flip-out stand and the battery is included. What we liked about this style is that the Etekcity is ready for use right out of the box. The test leads come with a 3-foot long cable that have caps at the ends. The switch on the center of the box is easy to snap into place as you make adjustments. One added feature we liked with the large dial is that if you turn it to off, the entire machine shuts down. This is a convenient feature that makes it easy to work with and we liked that manufacturers built it in. Ohm settings are on the left third of the dial, voltage is at the bottom third and voltage is on the right third. Having all of your readings on one dial is convenient. You won’t have to check for what mode you are in. What we noticed as most evident with the Etekcity is that it is simpler than other options. Again—that isn’t a bad thing. It just means that you have a more straightforward tool. We can see this tool being used for more routine applications. If you are looking for a simple-to-use and straightforward multimeter to take with you on jobs, the Etekcity is a great companion. Not only does it give you the information you need, but it’s easy to transport and easy adjust. As our budget buy, it is perfect at rounding out our list. With multimeters we decided that range, LED readouts, build/hold and dimensions were all important. We imagined HVAC techs or electricians rushing from job to job and asked “What would they need in a tool?”, “What would be most helpful?” We decided that the ranges were critical. Meters needed to be able to provide a lot of information quickly. Also, LED had to be clear to share that information. The build was important because of how well a worker could grip it. Finally, dimensions would be a concern. We wanted to be sure that every meter we promoted had a good “feel” to it when in use. Having shared our criteria for advancement, here are our individual thoughts on each one. We wanted each one of our multimeters to have a great reading range. The reality of working on any job is that some products will be up to par, and some won’t. We wanted to be sure that our multimeters were able to work in any situation. Our goal was to find the products that were most useful for a wide variety of people. Who uses these tools? Field techs and electricians primarily. We wanted to arm them with the perfect tool to get readings they needed. We also demanded that the tools had a great range on every reading they claimed. For example, if one multimeter only gave 5 readings, we wanted it to have a wide and informative range for those 5. On the other hand, if manufacturers claimed their tool gave 10 readings, then all 10 had to have that same quality. If you are going to package it into your product, make sure it is valuable! We demanded a lot our selection because of the important information they were sharing. If they were going onto the worksite, we wanted them to be as helpful as possible. The next consideration we focused on was the LED screens. The setting where field techs have to work aren’t always the optimum. Sure some jobs may be in a bright and well-lit area, but some aren’t. Some jobs involve crawling into tight spaces that are dark and have no lighting at all. We wanted to be sure that the meters were easily legible in these areas. We wanted LEDs that were bright and also large-print. “No squinting required” was our motto for a while there. Again- we always look for tools that will help users and make their jobs easier. Having a great LED screen that projects—in darkness and light—is a huge benefit. We especially liked the models that had “hold” buttons on them for ease of taking a readout and then transferring it to paper. Next we looked at the built of each of our contenders. Sure it would be nice if every field technician had to take readings with their tools in a cool-air plush office setting, but is that a reality? Not really. Most of the time, multimeters are used for either setting up a space or bringing a space up to code. That means that a lot of the details aren’t sorted out yet and not yet comfortable to work in. Technicians are called upon to make their way into the bowels of a building and get the safety readings needed to further construction. This makes it critical to have tools that are easy to hold and durable. We looked for the multimeters that were covered in plastic/silicone. They had to be drop-resistant, dust-resistant and water-resistant. When working at a job site, it’s easy to drop machinery. Without a drop-resistant case, the tool would surely have a short lifespan. Same with dust and water. Manufacturers who took these things into account and built their multimeters to last won us over. Finally, we considered the feel of the multimeter. Again, technicians who were working with them have to be comfortable with the design. We wanted to choose the tools that were designed for good grip. Some had silicone easy-to-hold outer coatings. Not only were these functional due to drop-resistance and water-resistance, but they also were easy to hold. If a technician has gloves on, we wanted the equipment to easily fit into their hand without the fear of slippage. We also wanted the multimeters whose manufacturers built them with tapered sides and shapes that in general made them easy to hold. We didn’t want any bulky or difficult to manage tools. So there you have it—our list of the best multimeters on the market today. We tested them all thoroughly and weighed them up against other options to make sure they truly were the best. We’re more than satisfied with our list due to how picky we were. If you need a multimeter, consider any of the four we came up with. Our top three and our budget pick are all helpful, easy-to-use and great tools to add to your work arsenal.